It is one of the greatest rice recipe I have invented so far. Result was so amazing that I have made this 8-9 times this year. Basically, whenever we eat in park, I make pulao n choley(masala chickpeas) to take along with. So I keep trying little variation to pulaos. This is bestest of all my experiments. So I thought of clicking a pic first than serve this time because it furrrs (flies) within few minutes without giving me a chance to click. See, this pulao needs two time garlic to be added. Without garlic I have never made it so pls don’t accuse me if it doesn’t turns good without garlic. Ingredients – For 2-3 people. Mix all very well in a bowl and keep aside for 1 hour. Bake in a baking tray for 30 minutes at 250 Degrees till paneer cubes are little brown or corners are dark brown. Take it all in a plate and scrap the not too much burnt masala too alongwith. In a cooker (yes cooker) heat up the desi ghee and add grated garlic till it is dark brown. Add rice and all other things.Close the lid and take 1 whistle in high flame and two whistles on lowest flame. After that close the flame. 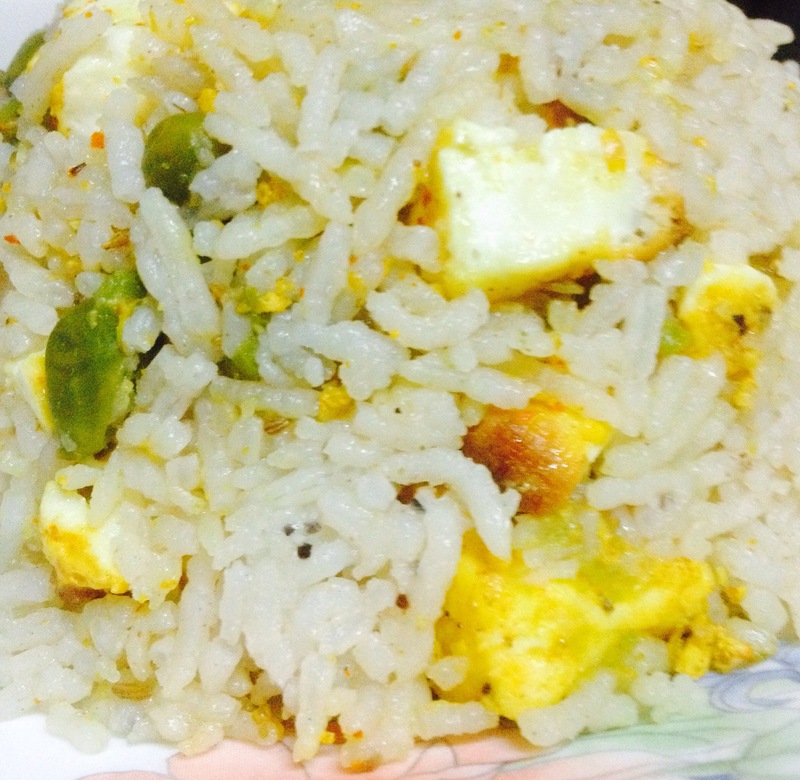 Now after 15 minutes add baked paneer tikkas to this pulao and mix well. Close the cooker lid and put on lowest flame for 4-5 minutes and close the flame. This pulao goes (very very very) well with raita made of carrots, green chili, red onions and curd. Hi, this is Roydin here from Biscotti Media Productions, we are currently working on Master Chef season 5 and are looking out for people who might be interested to participate on the show as contestants. Can you please let me know if you or any one whom you know might be interested.